Complex rides are challenging to design. Understanding how to design amusement park rides can help park guests better appreciate the unique and exciting attractions available at their favorite theme parks. Designing a ride is a challenging process with many different factors to consider when creating a successful, popular ride. Park Managers: The management team of an amusement park understands the most popular attractions of the park, the guests they want to attract for future visits, and the appeal of existing rides so they can design something new and exciting for the park to unveil. Engineers: All types of engineers, from electrical specialists to structural and mechanical engineers to computer engineers, are involved in the detailed process of creating a new ride. Depending on the type of ride, the safety systems it requires, and how innovative it is, just a few experienced engineers or an entire team of professionals may be involved. 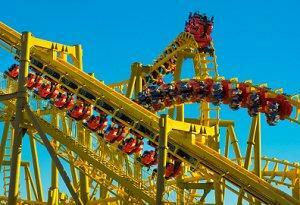 Business Managers: An amusement park is a business, and the park's accountants and business managers must set a realistic budget for a new ride as well as follow up during design and construction to be sure the ride is financially sound. Parks often have the choice between tried and true "clone" rides or customized, specially built rides. Both types of ride designs have their pros and cons that must be considered when designing a new ride. Clone rides are designs that have already been built and are installed in other parks. Because they have already been used, these designs are usually quite stable and well known, which leads to fewer engineering difficulties when the ride is built. At the same time, however, these rides are not as unique and may not be as attractive to park guests. Custom rides are designed for individual parks based on their specific needs and preferences. These rides are typically more expensive than clone designs, but they also offer a completely new experience for park guests and can get much more media attention to draw in new visitors. New designs can be tricky, however, and if a ride is especially innovative or unique it may have operational flaws that will need to be worked out for several weeks or months after the ride has opened. 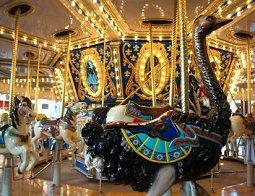 There are several basic steps for designing amusement park rides. Budget: The park first needs to set a budget for a new attraction. This budget may include the ride's design and construction, marketing, and projected operational costs. Unique and innovative rides are more expensive, as are larger rides such as roller coasters. Park Needs: Before choosing a new ride design, the park will evaluate its existing rides and determine what new attractions are needed. A park with many roller coasters may want to add more family attractions, or a park in warm climates may prefer water rides that will keep guests cool. Space: The area where a ride will be built is critical for its successful design. Not only does the actual space the ride needs have to be considered, but also the surrounding landscaping, crowd flow, and facilities such as restrooms, on-ride photo booths, and queue lines. Designing a ride in a very small space can be tricky and will usually be more expensive than if there is ample space to work with. Type of Ride: Once the first considerations have been discussed, the type of ride must be decided. Parks can choose between roller coasters, enclosed rides, small circular rides, larger flat rides, or expansive rides such as car rides or other attractions that need a lot of space. Ride Layout: This is the step that requires the most work. Individuals who know how to design amusement park rides must consider the ride's duration, safety mechanisms, structural forces, thrill factor, engineering needs, and desired end result when planning the ride's overall layout. Theme: The last phase of designing a ride is choosing the ride's theme. This includes the ride's name, color scheme, decorations, and a possible backstory that will add mystery and excitement to the experience. Ride themes are also designed. Once these steps of the ride design are complete - and it can take many months to create a new ride - construction can commence and park guests will begin to anticipate the unveiling of a new and exciting attraction. Theme parks choose to design new rides for a variety of reasons. While park guests may enjoy existing attractions, it is new and innovative rides that appeal to new guests and keep visitors returning year after year. A new ride may replace an older, outdated version with a more thrilling, safer, or more modern attraction, or a new ride may help complete the park's lineup of attractions for all ages and types of guests. Guests who have a basic understanding of how to design amusement park rides can appreciate how complex the process is, and in doing so they will better appreciate their favorite rides and attractions on their next theme park getaway.